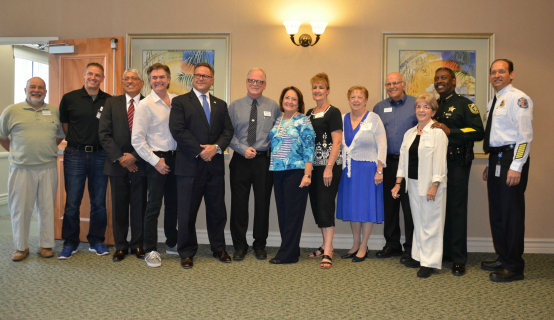 Mayor Teresa Jacobs and other representatives from Orange County recently attended the Annual Community Association Meeting at Hunter’s Creek to discuss progress on current and future infrastructure and roadway projects. Orange County staff provided brief updates on community projects to the association’s Board of Directors at the meeting. With a population of approximately 25,000 individuals, Hunter’s Creek is one of the largest homeowner associations in Central Florida. During the meeting, Mayor Jacobs recognized John Rasnic, who is retiring as Hunter’s Creek Community Association general manager after 25 years of service. In 2011, CNN/Money and Money magazine ranked Hunter’s Creek No. 21 on their list of the 100 best places to live in the United States. Criteria included financial, housing, education, quality of life, leisure and culture, and weather data.